I'VE always loved the idea of ancient gods using our planet as a plaything, moving geographical features around like chess figures. Then, an accident. The proud owner of a new mountain range watching in horror as it was dropped and smashed into a million pieces. No chance of putting it back together again. Just sweep up the mess and leave it to the side to be dealt with at a later date. Except, it's still there. Welcome to the Cuillin of Skye. There's something otherworldly about Scotland's finest range, a collection of peaks, ridges and corries that seem almost alien compared to the rest of the country's mountains. The area it covers is relatively small, but no matter how many times you venture into this landscape or how well you think you know it, there are always surprises in store. Our latest venture into this symposium of Sgurrs coincided with a storm front rattling in to our corner of the north-west bringing gales and heavy rain. Even for the guides who often operate in less than favourable conditions, the idea of tackling the more technical summits was a non-starter on the first day. While others settled for low-level walks or distillery visits, I gambled on heading back over the bridge and out of the worst of the gloom to Glen Elchaig. I still expected to get wet and battered about but without the possibility of any life-threatening situations. The further east I walked, the more benign the conditions. It was odd looking over my shoulder and seeing the grey swallowing the scenery while the route ahead remained clear. I managed to catch views from the summit of Carn na Breabaig, the westerlies helping push me up the slopes and drying out my gear from the rare assaults of drizzle which managed to reach this far. The next day promised better conditions, still wet and windy but much reduced from the ferocity of the previous 24 hours. It was time to head into the Cuillin. We decided to walk into Coire Lagan and aim for the ridge from the Sgumain Stone Shoot, a route that would give good protection from the elements and the option of a fast turn-back if conditions deteriorated. 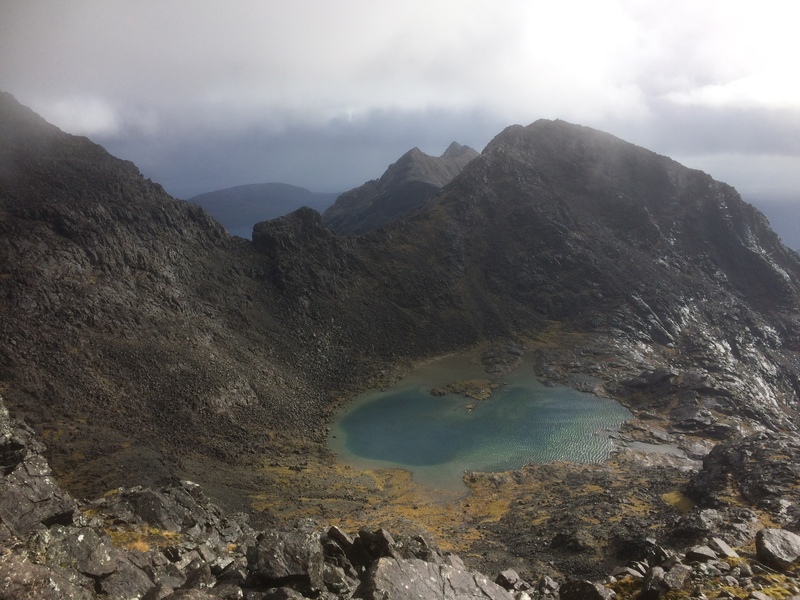 If things went well, we could cross the ridge and descend via the neighbouring Coire Ghrunnda. On damp days, the Black Cuillin live up to their name. We were in a dark and forbidding amphitheatre of weeping black walls and glistening obsidian slabs which soared above us before vanishing into the clinging mists. The higher we rose, the more the autumn colours of Glen Brittle were squeezed out. The door behind us was being shut and we would soon be locked firmly inside this rock labyrinth. We stuck close to the oppressive wall on our right, working our way through a maze of boulders which often necessitated a few steps back to make progress. We probably stayed too far right for too long but eventually we managed to cross over for the final scree push. When we emerged on to the rocky tightrope between the two corries, the cloud that had been holding on to the heights blew through to reveal a view that never fails to thrill. 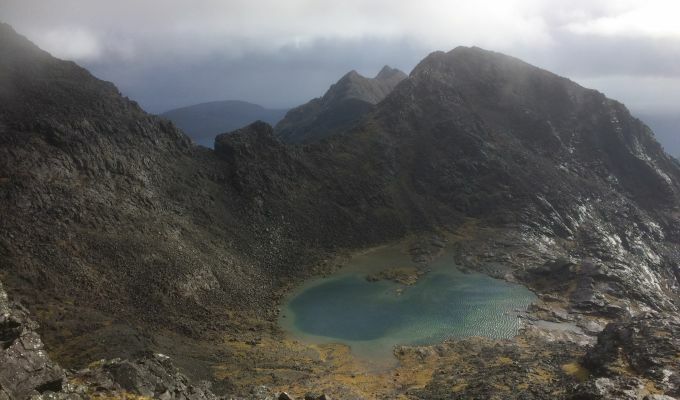 Hundreds of feet below lay Loch Coir' a' Ghrunnda, a turquoise oasis which seems more suited to the coral pools of the Caribbean than Skye. The circling peaks sparkled and shone as the sun picked out every speck of moisture on the faces. The wind was funnelling furiously through our standpoint on the ridge so we started climbing through boulder territory to the summit of Sgurr Sgumain. We lost visibility again briefly in a driving snow storm, but this worked to our advantage as the sudden emergence of Skye's highest peak, Sgurr Alasdair, was even more dramatic. I always think this is the finest view of this mountain, a towering, intimidating, blade reaching for the heavens. The connecting ridge ahead was a step too far on a day like this and we dropped down the scree on the other side to reach the lochan. Here we sat in the sunshine for an overdue lunch break while little white horses reared up against the shoreline. It was mostly sunshine on the way down the corrie, the landscape filled with silver streaks and shiny slabs, and gold, russet and auburn vegetation filling in more and more with every step down. 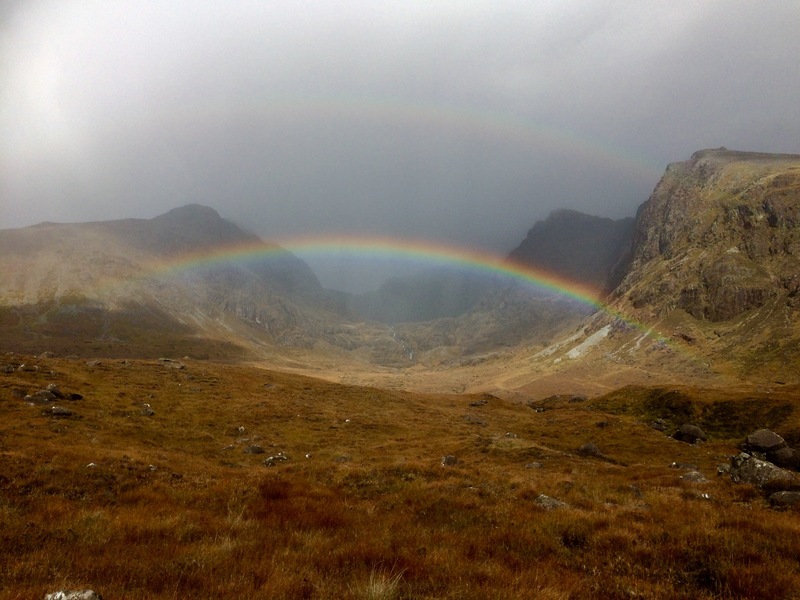 We got one last rain shower on the way out but it provided the perfect finish – a rainbow arch over the mouth of Coire Lagan. It felt as though the gods had smiled on us.